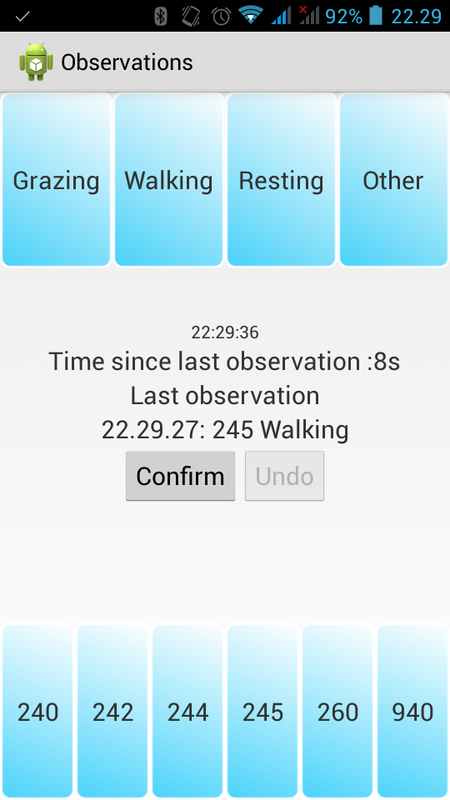 This app is made primary for field biologists logging animal behaviour, but it should also be usable for other types of classification logging. The logged data are sent to a user definable server. Logging is done by dragging a value from one of the fields on the bottom of the screen to the top of the screen and then press “Confirm”. If one realizes just after pressing Confirm that the observation was wrong, “Undo” is available to send an undo-message to the server. To make the possibility of registering or undoing observation by accident as small as possible, the “Confirm” button is only available for a short (default 20 sec, but user configurable) time after dragging an registration and the “Undo” button is available for the same time after pressing Confirm. When an observation is logged, the gps-position from the phone is also logged. The the app is on google play. The source code can be found on github.